Founded in 2000, DUALi has become a leading specialty manufacturer in Korea of contactless smartcard readers and modules releasing various models of Smartcard Reader Software, Smartcard Hardware, Smartcard Module, Finger Print Recognition Solution, and Wireless System Solution. DUALi has been an excellent solution provider of dual interface reader (additionally, Mifare reader, Felica reader and NFC reader) for e-passport solution & e-payment solution. The iTOUCH is a multi-purpose RF reader with widetouchscreen based on WinCE 6.0. System integrator can develop any type of application such as information displays & attendance terminals for companies, universities, hospitals, shopping malls, etc. iTOUCH, which recognizes each cardholder, can upload event logs to servers and provide custom-tailored information to the cardholder. The NFC enable multi-kiosk iTOUCH is a self kiosk that is useful for access control, time attendance, student attendance system, total information system, e-payment system, and all kinds of membership purposes of applications. 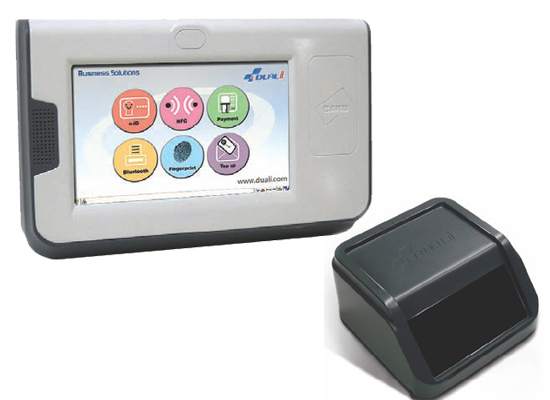 The company’s DE-EPASS is a smart reader combination of optical and RFID for e-document identification. It supports ICAO Doc 9303 (MRZ), and ISO/IEC 14443 (RF chip) compliant e-passport / any type of e-ID (ID1 format). It allows precise yet fast identification processing. Its benefits are: faster check-in; reduction of human typing errors; increase security level by double-checking of printed & RF chip photo; and easy management of priority customers and blacklists using SDK (DB management). Target applications for the product include hotel checkin, duty free shop ID check, airline check-in counter, and government / police office ID check.